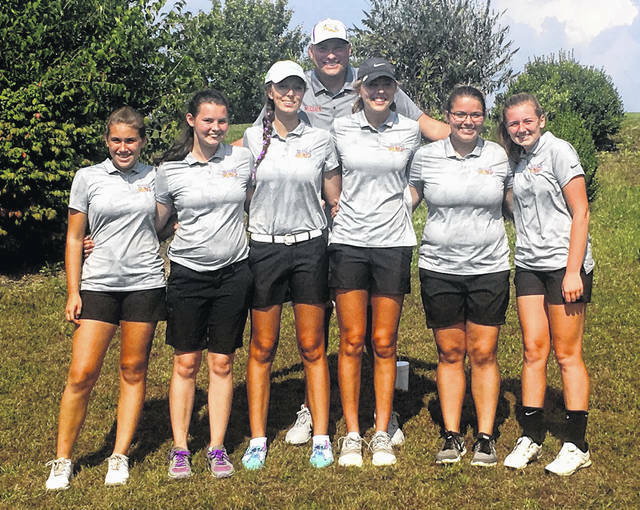 The McClain Lady Tigers girls golf team is pictured Thursday at Buckeye Hills Country Club where the Lady Tigers competed in the 2018 FAC girls golf tournament. Pictured back row: Head Coach Jarrod Haines. Front Row (l-r): Shayna Beatty, Cassidy Willis, Eriak Martin, Bryn Karnes, Lix Kegley and Bri Weller. The Hillsboro Indians and McClain Tigers varsity boys golf teams traveled to Franklin Valley Golf Course on Tuesday to participate in the Frontier Athletic Conference boys golf tournament, the Indians finished the 18-hole tournament in second place with a score of 346 and McClain was finished in third with a score of 350. The Jackson Ironmen took first place in the tournament with a score of 342, Chillicothe was fifth as they tallied a 365, Miami Trace took fifth place with a score of 374 and Washington finished in sixth with a final score of 398. Hillsboro’s Kristin Jamieson was the tournament medalist as she shot 36 on the front nine and 38 on the back nine for an 18-hole score of 74. Other scorers for the Indians were Gabe MyCroft who tallied an 87, Will Kiefer who finished with a 91, Gavin Puckett who carded a 94, Bryce Bledsoe shot a 106 and Brennen Priest had a 104 for Hillsboro. 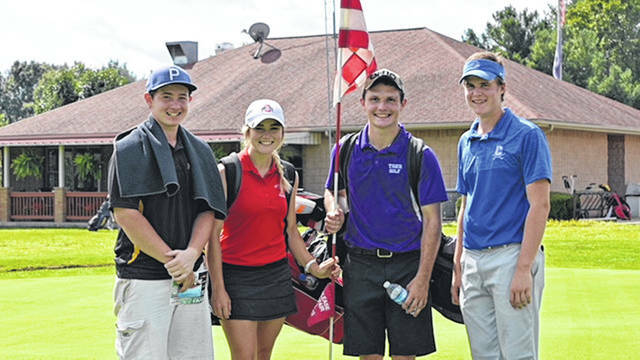 The Tigers of McClain were led by Trevor Newkirk who shot a 76 in the 18-hole tournament. Other scorers for McClain were Trenton Newkirk with an 84, Kobe Penwell finished with an 86 and Wes Potts shot a 104 for the Tigers. The Indians moved to 27-3 in FAC play this season and are currently sitting in first place in the league with one match remaining. McClain moved to 40-16 overall on the season and 19-11 in FAC play. The Lady Tigers of McClain traveled to the friendly confines of Buckeye Hills Country Club on Thursday and participated in the FAC girls golf tournament on Thursday and won as they posted a 408. McClain was led by Bryn Karnes who shot a 95 to earn tournament medalist honors for the 18-hole event. Other scorers for the Lady Tigers were Bri Weller with a 98, Erika Martin who carded a 102 and Cassidy Willis shot a 113. McClain was also represented at the toournament by Shayna Beatty and Liz Kegley as they posted scores of 115 and 121 respectively. The win completes an 18-0 FAC season for the Lady Tigers and improves their overall record to 26-2 on the year.